Maybe you are the couple that has just gotten engaged, and he decided to propose via flash mob, or maybe you both have an affinity to make people laugh and have a great time! Either way, choreography is the way to go. Consider that very popular dance that was viral a couple of years ago, when the couple danced down the aisle before their wedding. This is so unexpected and fun, that it lightened the mood, and made the anticipation that much more entertaining. The choreographed first dance is becoming increasingly popular with couples because they want to have fun, and do something different. Couples are now doing a nice slow dance for the beginning of the song, and then it suddenly stops, making it the dance song. This gets the attention of the crowd, while the couple is having a lot of fun at the same time. Doing a choreographed first dance is a lot of fun, and can also be a lot of work. Budget at least two to three weeks before your wedding for rehearsals, and practice often. Pick unexpected music and have fun! For the most part, the wedding planning process is done by the bride, and for the bride. The wedding ceremony and reception is built around the brides specifications, and the groom really doesn’t have a say in what goes on. Most brides don’t allow their future husbands to take part in helping plan the wedding, while others are begging for help. This can create a divide in the relationship, and some brides are taking notice. A recent trend in photography has men’s eyes wide open due to the new boudoir style photography. Brides are feeling the need to do a little something for their future husbands or new husbands, so they are making a “For His Eyes Only” photo shoot. Some brides feel like this is a “thank you” photo shoot that will make up for the months or year long crazy person they have had to deal with. The boudoir pictures can be taken in the comfort of your own home, or at a studio, whichever you prefer. Most of the time, the bride will be clothed, but not all the way. The bride has probably bought special lingerie to wear on her wedding, or just bought it for the shoot. Most brides have the pictures presented to the groom on the wedding day, sort of like a, “look what you get later”story for the groom. This boudoir style of photography is becoming increasingly popular, and is here to stay! Looking for that perfect up-do for your tresses on you big day? Take a few notes from this seasons top hairstyles. The Chignon: Typically a low bun on the side of the head that adds softness and will accompany any dress perfectly. This style is best with headbands or tiaras, and veils or birdcages. You might consider this if you are having a vintage style wedding. The Braided Look: You might find a braid amongst flowing hair curled at the ends with braids going through on the top of your head. This romantic look creates a look that stepped off of the red carpet. A Knot: This might be the perfect pairing for a more couture dress and what better than a knot to go with it! 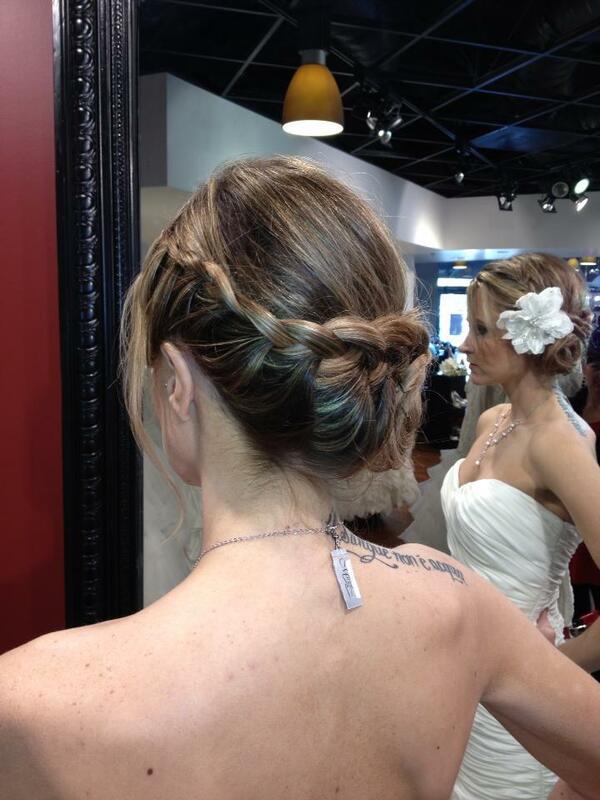 The knot is simply a knot in the back of your head, and how appropriate because you will be tying the knot! Beach Waves: A very popular look that can be achieved in a number of different ways. If you have a curling wand or a hair straightener lying around, you might want to use it! If using a curling wand, just twirl it around the wand and hair spray the curl, thats it! If using a hair straightener, simply twist your hair and flat iron it, thats it! Perfect Ponytail: You can channel the 60’s by simply having your hairdresser tease your hair into a high ponytail, making it look effortless. This will be the perfect addition to any gown. For Short Hair: Consider doing a short bob with finger waves, and adding earrings to compliment the look! This will look great! If you don’t have a short bob, consider having your stylist tuck your hair under and create an up-do that way, this is chic and very stylish. For bangs: Consider doing a face framing braid just over your bangs to create a softer look. Then, curl and twist the ends of your hair, and instantly your hair looks great! Deciding who you should include and who you should leave out when it comes to the wedding party. Keep it simple: the more is not really the merrier when it comes to bridesmaids. If you have too many bridesmaids, it might be hard coordinating with them for wedding related events. In addition, fitting multiple girls into the same dress, as many brides do, might not be as flattering as you want it to be. Your sisters will be the perfect addition to your bridal party! Avoid the drama: If you have a friend that likes to stir drama around, you might consider leaving her out of the bridal party. Maybe having her do something else for the wedding like give out bubbles or even speaking at the ceremony. If you were in her wedding, that doesn’t mean she has to be in yours! Most brides think this is proper etiquette, you simply don’t have to have her if you don’t want to! 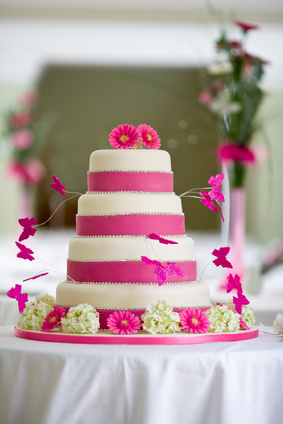 Choosing Your Wedding Cake – Real or Fake? Make sure you pick out the right cake for your reception. Choosing your wedding cake may be the most delicious aspect to planning your wedding. You want your cake to reflect the personality of you as a couple. You want your guest to leave your reception and still be craving your cake as weeks go by. Here are three tips to helping you create the perfect and most delicious cake for you big day! Is it possible to try on too many wedding dresses? If you’re a fan of Say Yes to the Dress, you’ve undoubtedly seen a bride who’s tried on 100+ dresses without finding the right one. Most brides try on between four and seven gowns, and shouldn’t try on more than 10, because it can lead to confusion. 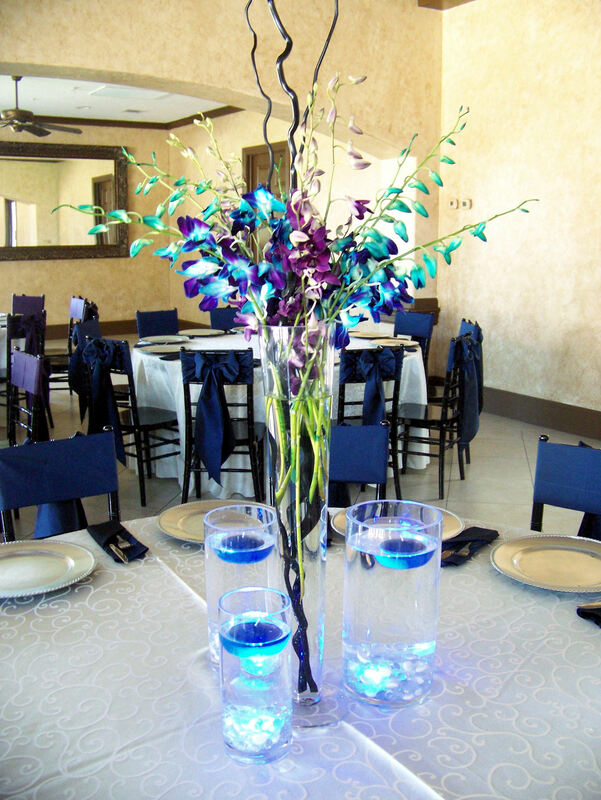 A beautiful purple and blue theme. 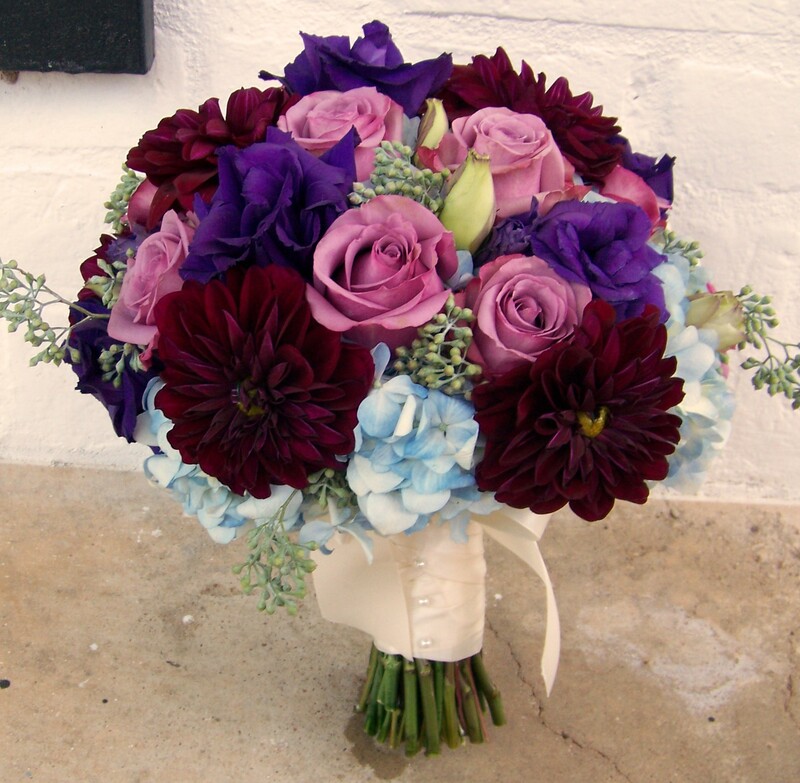 These pretty colors will add the perfect touch to a spring or summer wedding. 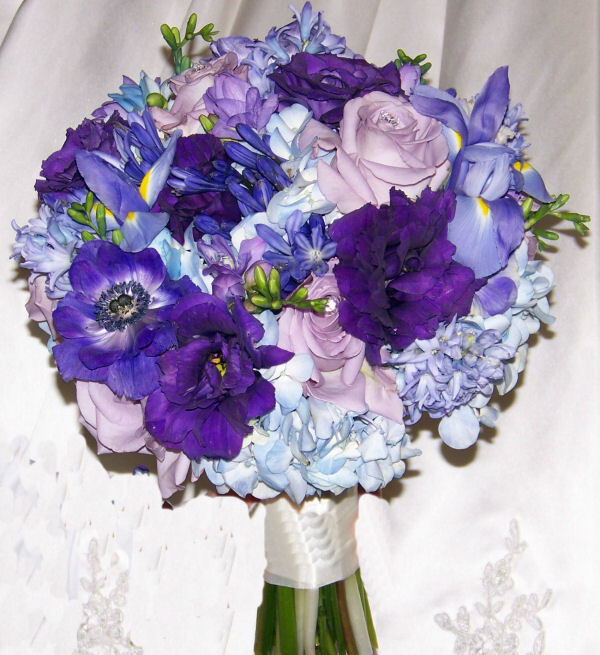 Mix purples and blues for an elegant color combo; don’t be afraid to mix both colors in your bouquets. 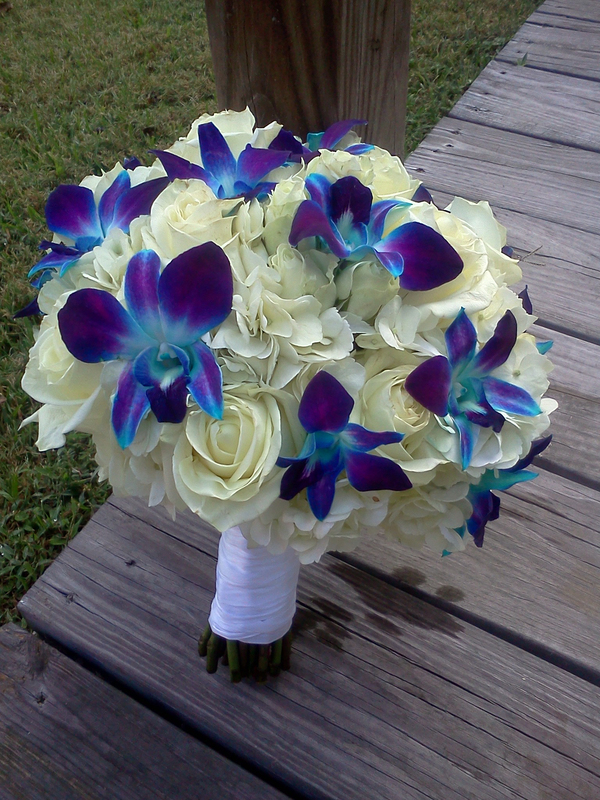 For additional flower ideas visit www.lzfloral.com. 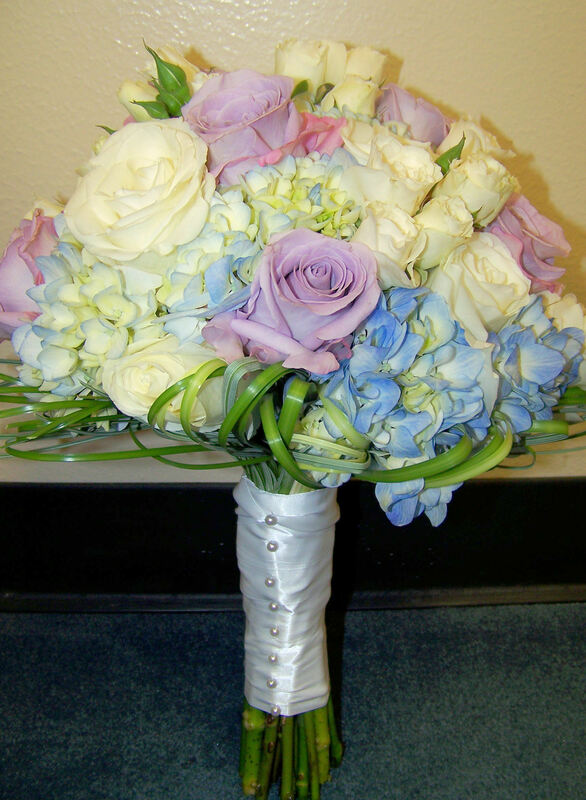 To schedule a consultation to discuss your wedding flower send an email to weddings@lzfloral.com or phone 281-813-5145. All pictures were taken by LZ Floral Design. 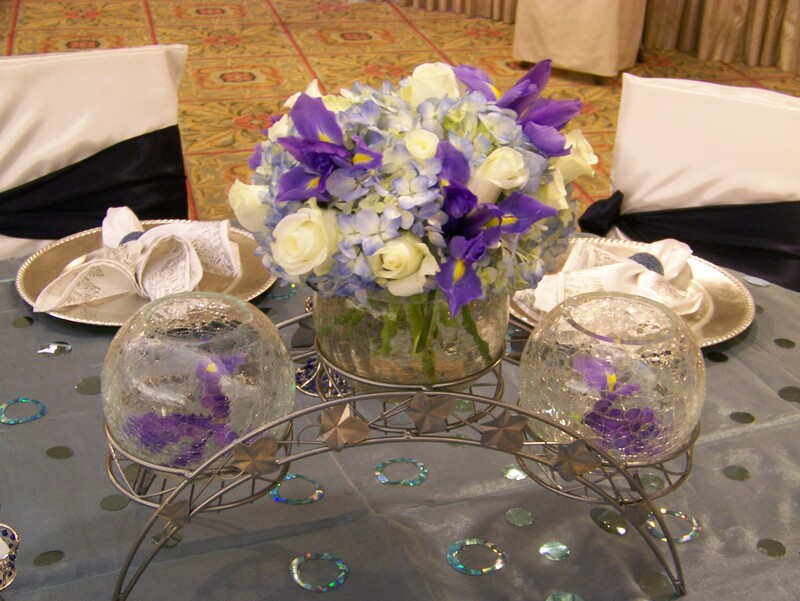 LZ Floral Design is a full service wedding and special event florist serving the Greater Houston area. A new trend in photography is engagement pictures or an e-session. An engagement session is typically held by couples who want to get some professional pictures done before the wedding. Having an e-session is advantageous in many ways. You can meet and get a feel for each photographer before the engagement, wedding, or even bridal portraits. Talk to your friends and see who they might recommend for your engagement and bridal portraits, they might just know someone they’ve used in the past. After all, nothing is better than personal experience! YOU AS A COUPLE: If you have a certain game that you play like Monopoly or Scrabble, play those games and capture the fun of winning and the sting of defeat in your pictures. This will create a relatable and memorable picture that you can treasure for years to come. Do you as a couple like to go to the movies? Head to the theater and let your photographer tag along! Get pictures taken while waiting in line for tickets and popcorn, even sitting in the seats. These everyday shots will look great too! HAVE A FAVORITE MOVIE? : Your favorite might be “The Notebook” or “The Dark Knight,” it doesn’t really matter- just dress up and have fun. A gorgeous engagement session inspired by your favorite movie might be just the ticket to getting some incredible shots. If you search on the internet, you might be able to find some engagement sessions to spark your interest. SNAP SOME PORTRAITS TOO: You are already paying for pictures, why not take advantage of some pretty shots of you too! The lighting is good and you are already dressed up, might as well benefit from the opportunity! CHANGE YOUR CLOTHES: Take some extra clothes along with you to your shoot and change it up! When you change your clothing you are add more interest to the shoot. It will be that much more fun to look back on your memorable engagement session years down the road.